I spent a number of hours testing a SBC in a retail POS to find out why Android failed to boot sometimes, turned out to be the cables. Shorter is better! Resist the cheap cable, or it’ll resist you! I think what happened on yours is just a fluke. *Ahem*, that’s “USB Type A” please! There are phone apps that will show you charging current. I’ve used it to suss out good vs crappy USB charge cables, sometimes, right in the store. Somebody please punch me in the face if I’m spouting nonsense but … this looks like a really roundabout way to measure the cable resistance using an ohmmeter. I mean, let’s take his first cable, the horrible one. A voltage drop of 0.645V at 0.1A calculates to 6.45 Ohm, and the end of the test where the load gives out, a voltage drop of 4.223V at 0.654A calculates to … 6.45 Ohm. So it’s completely linear. Somebody CMIIW, I’ll happily stand corrected. Yup, multimeter is a good way, but add the connectors too! Also make sure to wiggle things around because crappy contacts are also very possible. I also think that once you put a low of current through the cable and the connector warms up things might change, so a long term test might also be good. People might not really know this, but usb connectors are designed so the cable one wears out while the device one stays intact, so that you replace the cheaper part. Yes, of course including the contact resistance involved all around. I guess my point was “current does not actually matter” as long as it’s below where it physically destroys the cable (or the connector) by turning it into a heating element. The curves he charts down at the end of the video seem to support this assumption. Yep, makes sense. Any ‘dumb’ load will do provided that the resistance is within a reasonable range (maybe 0.1-1 ohms). I’ve had my share of USB cable power delivery problems, since we use USB to power the RGB Shades. Can’t use a thick USB cable because it’s difficult to wear. Eventually broke down and had custom power-only cables & overmolds made with thicker wires than the best USB cables but overall diameter still thinner and more flexible than a USB mouse cord. Walmart’s cheap ~ $6 USB cable is quite nice. Thick insulation and wires. The micro B connector latches in solidly and charge checking apps show it able to transfer the same power as the cable that came with my phone. I bought a 10 foot cable off eBay, nice looking with braided cover. The wires are so thin it can’t even pass 400ma. At least it was cheap. O great! Now Walmart will read what you posted and tell the manufacturer of that cable that it needs to be made cheaper! Recently my Nexus 7 would charge correctly while turned off, but the battery would actually *lose* charge if the tablet was switched on and in use even with the charger plugged in (though at a slower rate than if on battery only operation). Turns out those 99-cent store USB-A to Mini-USB cables are exactly what they are worth. The USB wire gauge was so thin, and hence the resistance so high, that the voltage drop between charger and tablet was sufficient that the charger wasn’t supplying enough juice to run the tablet itself (so the current necessary to make up the differnece was being drawn from the internal battery). Switching back to the original ASUS USB cable solved everything. Never buy 99 cent store crap. A friend was building a project and he needed some heavy gauge wire so he went to the 99 cent store and bought some jumper cables. When he cut off the ends he discovered the the fat wires were all insulation with a tiny wire inside. It’s hard to imagine that you could really jump a car with such a small wire. I needed to wire up data to a 1/8″ stereo plug. Rather than soldering 3 conductors to RadioShack plugs, I went to Dollar Tree and bought 3 sets of earbuds thinking, I just need to cut the ear buds off and I’ve already got wires soldered to the connectors I need. I cut off the first ear bud to find it was connect by two wires each smaller than 30 gauge! Also beware of buying wire on ebay. A lot of it is CCA, or copper clad aluminum. It’s dirt cheap and still fairly good value, but be aware that you need a thicker gauge for the same ampacity. I had a medium price USB extension cable but I needed another one, so I bought one at one of those super discount stores and it turned out to be better than the higher priced one. A think there is no real simple formula for buying stuff. In the defense of dollar store cables — it’s hit or miss. I’ve found some that were very good, in which case I cleaned out the store, and others that were crap. The only way to tell is to test them. The nice thing about a $.99 cable is, that even if it’s a good one, when it inevitably dies, you can throw it out without worry. Also, if it’s crap to begin with, it only costs you $.99 to find out. 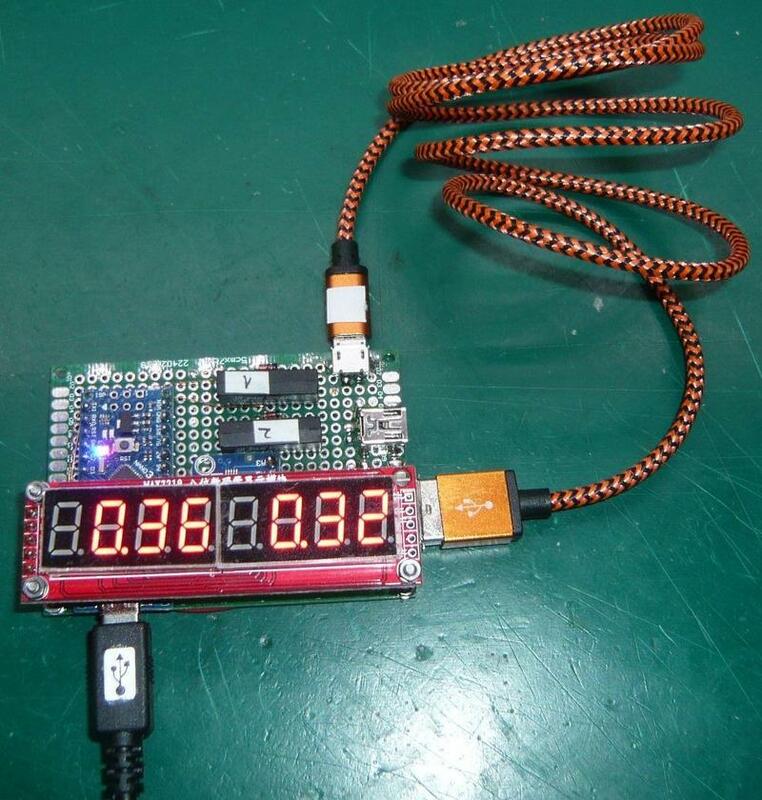 Do not spare a little money and have in your workshop this small USB tester. Arduino Nano 168, ADS1115, Max7219+LED and some vegetables. Doing work for a hardened computer company, we discovered that the (“budget”) over-molded SATA power connectors could sometimes retain solder paste that would conduct between pins within the overmolding. Some more than others, one unit caught fire! The lesson was to use the connectors with mechanically locked pins, not the overmolded ones.